Copyright - Zac Poonen (1986). This book has been copyrighted to prevent misuse. No part of it may be copied or printed or translated without written permission from the author. For further details, please contact: [email protected] or Christian Fellowship Church, 40, DaCosta Square, Wheeler Road Extension, Bangalore-560084, India. 50. 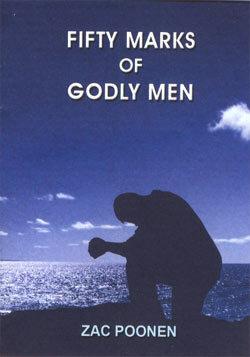 Godly men will be totally uncompromising like the apostles and prophets of old. God's work in the world suffers today, because such men are few in number. Determine with all your heart that you will be such a man for God, in the midst of a sinful and adulterous generation and a compromising Christendom. Since there is no partiality with God, it is possible for you to be such a man, if you yourself earnestly desire to be one. Since God demands commitment and obedience only in the conscious area of your life, it is possible for you to be such a man, even if the conscious area of your life is limited. (That area will keep increasing as you walk in the light and press on to perfection). There is no excuse then why you cannot be such a man. Since nothing good dwells in your flesh, seek for grace from God to have the virtues listed above. Cry out to God daily that He will fill you with His Holy Spirit and give you grace to be such a man in these the closing days of the age.